Community gardens throw a cross-section of people cheek-to-cheek, shovel-to-shovel, on a continual, regular basis. There's bound to be some issues. Community gardens make wonderful additions to any city — that’s not in dispute. But let’s face it: Any time strangers mix, you can’t always bank on good behavior. Children’s birthday parties turn into brawls. Subway riders become instant enemies. Department store shopping looks like trench warfare. Community gardens throw a cross-section of people cheek to cheek, shovel to shovel, on a continual, regular basis. There’s bound to be some issues. Scrolling through community garden message boards, you can find dozens of similar indictments. In Galveston, Texas, one woman says fellow gardeners stole her eggplants and lopped the heads off her sunflowers. Another gardener plans to buy magnetic sensors and decoy tomatoes to trap thieves. Bobby Wilson, president of the American Community Gardening Association, says he’s encouraged people to shake flour on their plants: “Would-be thieves think it’s some kind of poison,” he says. Some theft comes from hungry outsiders, but there’s plenty of inter-garden pilfering too, with motives ranging from gluttony to spite. (Collins is convinced a greedy garden member made off with her zucchini.) More gardeners are now locking up their plots, according to Beals, an added layer of security on top of perimeter gates. The downside to this trend? She says people now steal each other’s combination locks. Removal of the homeless also comes into play. Gardens have a fenced-off leafy appeal; Beals says it’s common to find people bedding down among the produce. It’s not her favorite role, but the LACGC performs swift evictions. Other communities take these thefts a little harder. This April in Boston, the robbery of water piping from a community garden was called “devastating.” In Tampa, the August robbery of tilling and mowing equipment led to an outpouring of community support and sympathy. A Houston group of community gardens lost $4000 worth of equipment in September; “I don’t know how we are going to be able to go forward,” said a garden director. Some garden theft is straight cash money. Most community gardens require some type of member dues; Beals says allegations of fraud are common. Members accuse garden directors of skimming some off the top, or of pocketing cash without issuing receipts. “These allegations come up all the time,” she says. Urban neighborhoods often encompass two or more distinct ethnic or racial groups. If these groups have tensions, expect them to play out in the garden. The most marked recent example is the Queens flare-up, where an old guard of Korean gardeners threatened to kill themselves — and others — when the city tried to make them share the garden (check out some fistfight footage here). 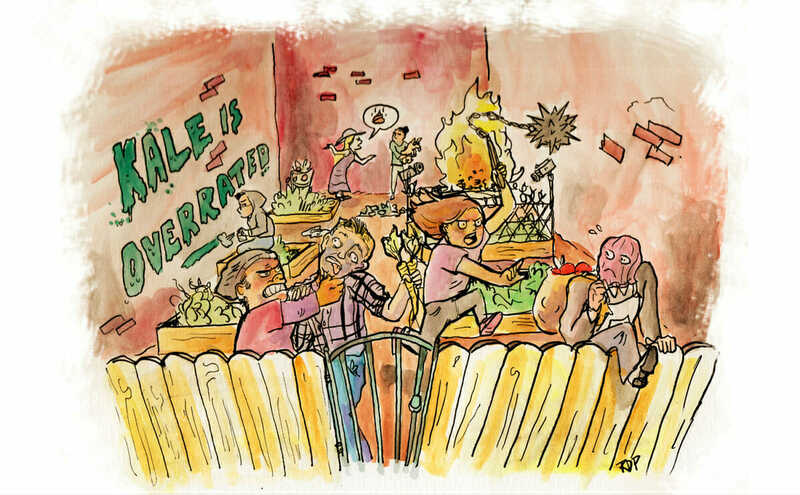 Many community garden feuds are small. Campbell claims a fellow gardener took over her plot while she recuperated from a broken leg. Collins got into a flame-out with her garden’s manager, after the woman watered her plants without her asking (“I don’t want root rot!”) One gardener in Atlanta describes a “nightmare situation”: a child knocked over his blueberry bush and someone gave him low-quality soil. Each Los Angeles garden holds a monthly meeting, where LACGC members listen to people’s complaints and attempt to mediate. These meetings get heated; yelling and screaming are common. Still, it’s all part of the process. Beals believes it’s all part of neighbors getting to know each other, learning to work side-by-side.